Jeera rice biryani (Seeraga samba arisi biriyani in Tamil , Jeerakasala biryani in Malayalam) is an awesome, flavorful biryani that everyone must try at least once in your kitchen. 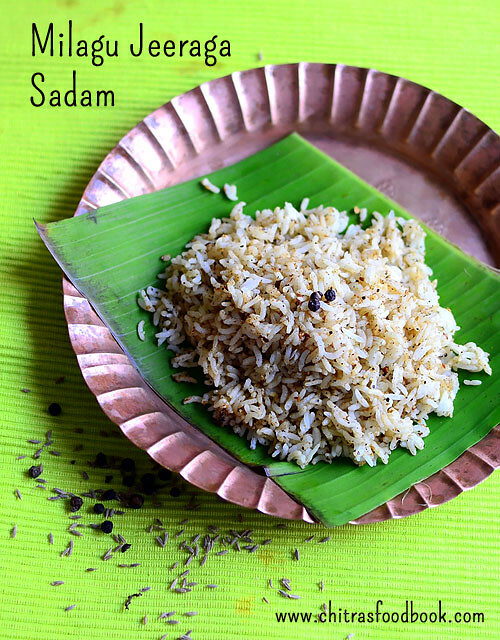 Most of the South Indian special, traditional biriyani recipes uses jeera rice.This tiny-grained seeraga samba rice gets its name from its resemblance to cumin, which is known as seeragam in Tamil Nadu. It is also known as Kaima rice. Most of us use Basmati rice for making veg biryani. I was also using the same till I tried Ambur veg biryani using jeera rice. I just love its flavor and texture more than basmati rice. From then, I started to use this rice very often for preparing veg biryani at home. So far I have prepared Dindigul thalappakkati biryani, Bangalore special Donne biryani (Veg version using mushroom and soya chunks), Coimbatore Angannan biryani using seeraga samba rice. This is yet another version of Tamil nadu style jeera rice veg biryani using a pressure cooker. Its so easy to make. It tastes and smells awesome. I have used carrot, potato and soya chunks. You can use beans, green peas, cauliflower to make it colorful and healthy. 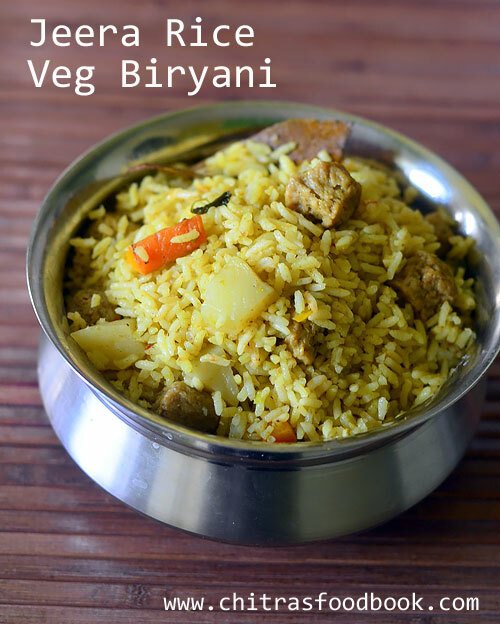 Do try this easy, yummy vegetable biryani using jeera rice in a pressure cooker. I am sure you will love its taste. 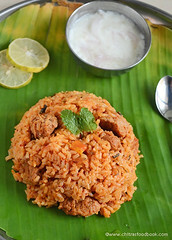 Ok, lets see how to make this seeraga samba biriyani with step by step pictures and video. Do check out my 40+ Vegetable biryani recipes collection. Wash and chop carrot and potato into thin, long strips. Grind ingredients for masala. Keep aside. Heat oil + ghee in a pressure cooker. Saute bay leaf and black stone flower. Add onion. Saute well. Add tomato, saute till mushy. Add masala paste, salt. Saute till raw smell goes off. Now add vegetables, soaked soya chunks, washed rice and mix well. Pressure cook in low flame for one whistle. Remove and fluff the rice. 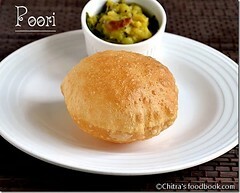 Serve with raita ! Wash the jeera rice and keep aside. No need to soak the rice in water. Wash and chop all the vegetables and keep aside. Grind all the ingredients given under “to grind” to a smooth paste.Set aside. Heat oil + ghee in a pressure cooker base. Saute bay leaf, kalpasi. Saute onion till transparent. Add tomato, required salt and saute till mushy. Add the ground masala paste, turmeric powder. Saute till its raw smell goes off. Lastly add the chopped vegetables and saute for a minute to coat the masala. Add water. When the water roll boils, add washed rice.Add some mint leaves if you like. Mix well. Pressure cook in very low flame for one whistle. Remove the lid after steam is released. Mix gently and serve hot with onion raita or brinjal gravy for biryani if you like. Adjust the number of chillies as per your taste. You can add 1 tbsp of grated coconut while grinding. You can also use coconut milk & water in equal quantity. Enjoy this yummy, flavorful Jeera rice veg biryani at home ! 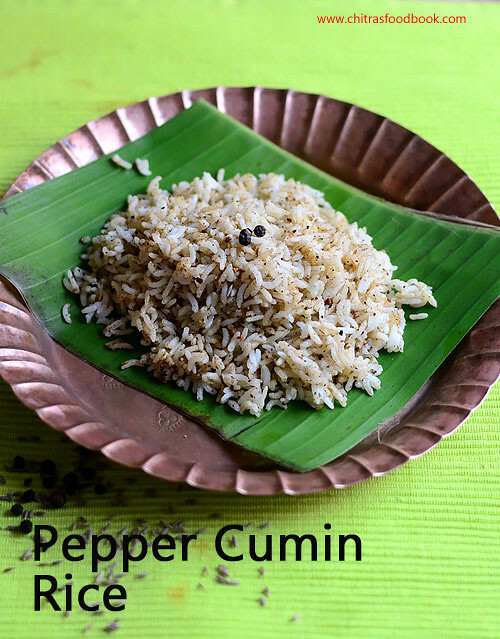 Pepper cumin rice / Milagu jeeraga sadam in Tamil is one of the yummy, South Indian rice recipes we make as prasadam for Navratri, Saraswathi pooja, Purattasi sani thaligai, aadi 18 etc. Yesterday I made this rice for navaratri afternoon neivedyam learning from my MIL. My MIL make this rice at least once in a week as pepper is a healthy Indian spice that helps to purify blood, improves appetite and digestion. Sendhil loves this rice variety a lot. So we make this pepper rice for his lunch box and one day travel as well. Sometimes we used to combine Saraswathi pooja, Purattasi sani thaligai festivals and make 5 rice varieties, chana sundal and thullu maavu(rice flour mixed with jaggery) for Saraswathi pooja neivedyam. 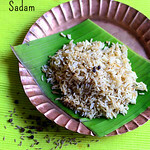 We make this milagu jeeraga sadam as one of the 5 rice varieties. As its so easy to make, I thought it would be useful for you all. I have already shared a video on how to make 5 rice varieties. You can replace sesame seeds rice/ ellu sadam with milagu jeeraga sadam and offer to God for tomorrow Saraswathi pooja festival. Lets see how to make this easy milagu sadam /pepper rice with step by step pictures ! Heat ghee in a kadai.Roast pepper & cumin seeds till it starts to crackle. Remove and grind to powder adding salt. Mix this powder with cooked rice. Heat ghee in a kadai and roast pepper & cumin seeds in medium flame till cumin seeds starts to splutter. Remove in a plate and let it cool down. Grind to a slightly coarse powder adding salt. Take the required cooked rice. Add 2 tsp of ghee, ground powder, mix well and check for taste. Add more salt & powder if required. Serve ! If you wish, you can temper mustard seeds, curry leaves in ghee and add to rice. Pepper alone gives spiciness to the rice. So you can add more pepper if you want spicy taste. Do not add more cumin seeds. Its flavor will dominate. Adding ghee helps to enhance the flavor and taste. If you don't want to add ghee, you can add sesame oil. 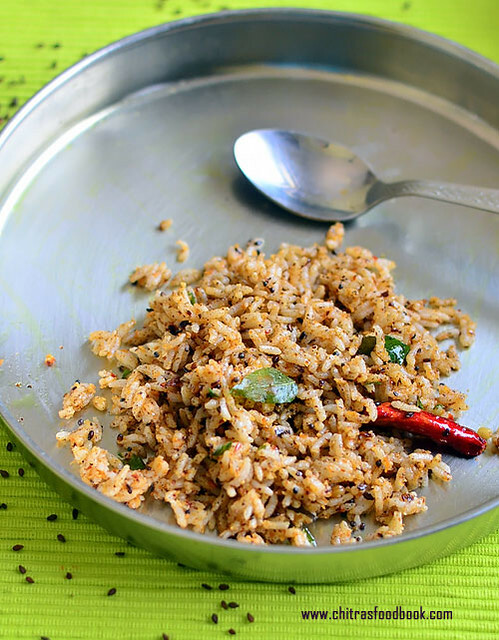 Try this easy and flavorful pepper cumin rice and enjoy ! We make ellu sadam ( Sesame seeds rice / Til rice) using black sesame seeds every year for Aadi 18 and Purattasi Sani thaligai. This is one of the 5 rice varieties we offer to God on Aadi perukku. As aadi 18 is nearing, I wanted to share this easy South Indian style sesame rice recipe with you all. 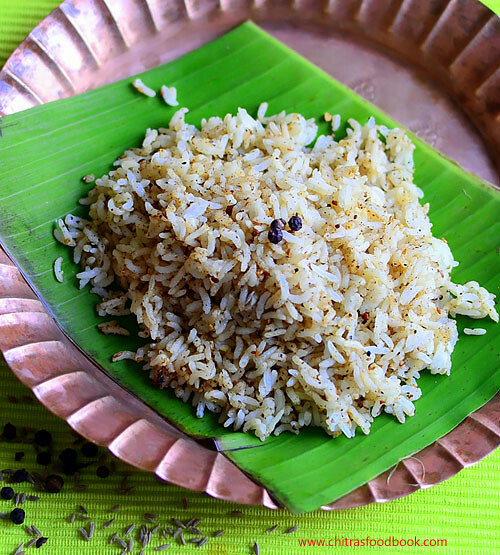 In Tamil nadu, this rice is popularly known as Ellodharai. I learnt this recipe from my MIL. For this rice, We make ellu podi using Karuppu ellu / black sesame seeds, urad dal, red chilli and roasted coconut .It is mixed with cooked rice. This sesame seeds powder can be prepared in advance and stored for a week. It can be prepared with white sesame seeds too but my MIL says black is more flavorful than white. Moreover black sesame seeds is preferred for festivals and pooja. 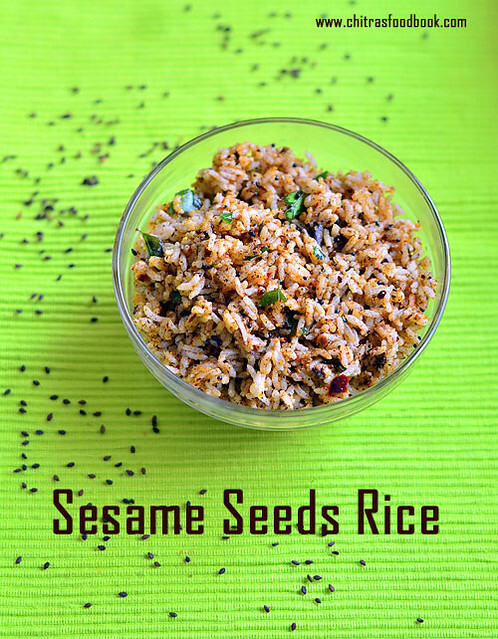 If you like sesame seeds recipes, you can make this rice for lunch box as well. As my family likes this rice variety, we make it as a travel food just for one day but without coconut. You can find that recipe in my Travel lunch menu ideas. 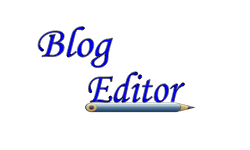 Today I have shared an authentic version of ellu sadam recipe. 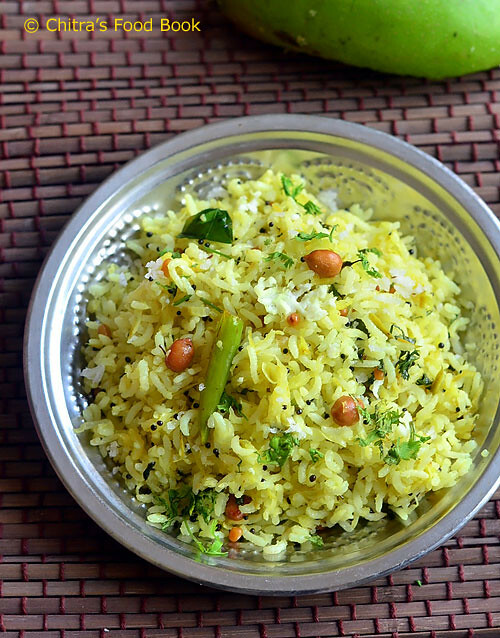 Do try this simple and quick rice variety for this aadi 18 and share your feedback with me. Tomorrow I will share a video on how to make 5 rice varieties easily for aadi festival. 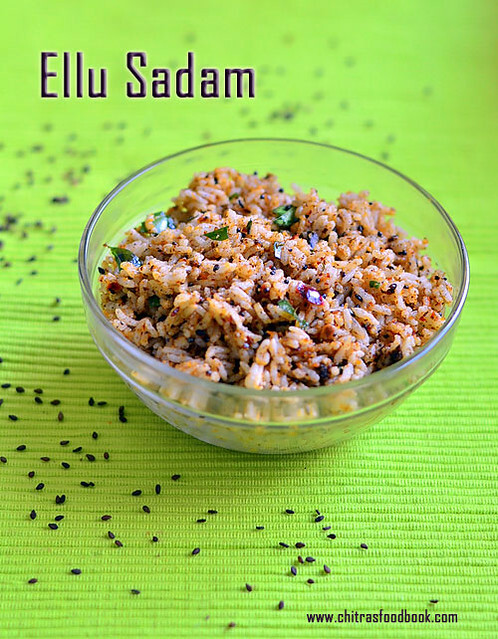 In that video, I have shared this ellu sadam recipe too. Do watch it to get a clear idea. Ok, now lets see how to make ellu sadam with step by step photo. Do check out my Ellu kozhukattai recipe for Ganesh chaturthi, Sesame seeds gun powder / ellu podi for idli, dosa and Tirunelveli style ellu thogayal for urad dal rice. If you are looking for Aadi 18 celebration procedure, click THIS LINK and Aadi 18 neivedyam recipes too. Dry roast sesame seeds till it crackles. Heat 1 tsp oil and roast red chillies, urad dal till golden. Lastly add grated coconut, roast for a minute. Remove, grind them adding sesame seeds and salt. Grind to a fine powder. Mix with cooked rice. Temper and add to rice. Mix well and enjoy! Pressure cook raw rice and spread in a plate.Cool down.Dry roast black sesame seeds till it crackles. If you keep roasting in high flame for 2 to 3 minutes, it will crackle. Remove in a plate. In the same kadai, heat 1.5 tsp cooking oil. Roast red chillies, urad dal till golden. Lastly add the grated coconut and roast till its moisture goes off. Adding coconut is optional but it helps to balance the taste of this rice. Grind the roasted dal, chilli, coconut and sesame seeds to a smooth powder adding salt. Do not grind continuously for long time. Sesame seeds release oil and make the powder wet. So grind in regular intervals. Ellu podi is ready. Temper mustard seeds, urad dal, red chilli and curry leaves.Take the cooked rice in a bowl. Add the required sesame seeds powder, tempered items and mix well. Add 1 tsp sesame oil. Check for taste before serving. Add more salt and sesame oil if needed. Mix well and serve ! Sesame seeds should be roasted properly else rice tastes bitter. You can add more chillies if you like spicy rice. For variations, you can skip coconut and roast urad dal, chillies. 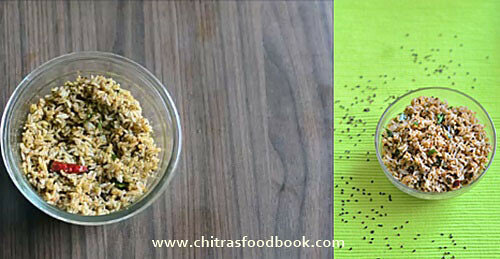 You can make & store this ellu podi in refrigerator upto 1 week. If you don't use coconut, you can store at room temperature. No need to refrigerate it. 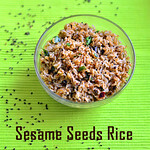 Try this easy sesame seeds rice for festivals, offer to God and enjoy! 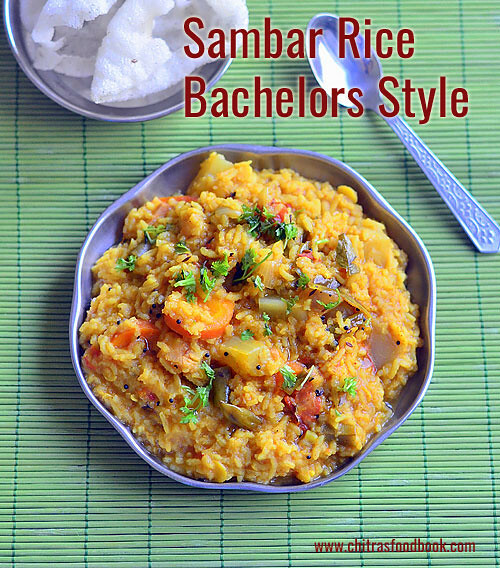 South Indian style Sambar rice / Sambar sadam using a pressure cooker is an yummy, healthy one pot recipe for vegetarians that is packed with the nutrients of rice, dal and mixed vegetables. Usually I make my hotel style sambar sadam at least once in a week for Sendhil’s lunch box. 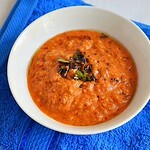 I prepare it by adding sambar powder made of freshly roasted & ground spices. Recently I saw this easy, bachelors style sambar sadam video in Tamil. 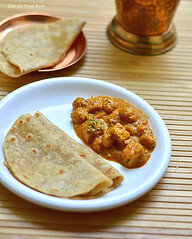 Its so easy to make, absolutely no grinding job, no pre-cooking of dals & no tamarind too. Yes, Its 100% a bachelors kind of recipe and it would be helpful for students, working women and busy moms to cook easily in the weekday mornings. I loved the idea and tried it the next day. It was so quick to make and tasted really good.I made few changes in the original recipe by adding mixed vegetables & spice powders to make it more healthy and flavorful. Sendhil love it a lot with rice papad or vadam as side dish.I loved it with pickle . It tastes good even if cools down. 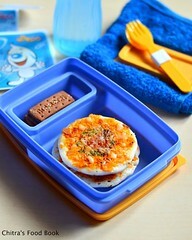 So we can pack this for lunch box as well. You can skip onion to make a no onion no garlic version on festival days. You can use almost all the vegetables except beetroot and bitter gourd as they dominate the taste. 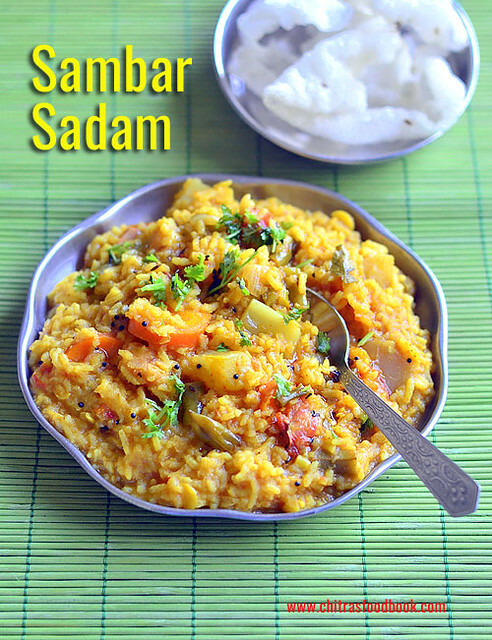 Friends, do try this easy, sambar sadam in pressure cooker and let me know your feedback. I am sure you will love its simplicity and taste. 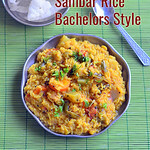 Lets check out how to prepare South Indian style Sambar rice with step by step photos and video ! 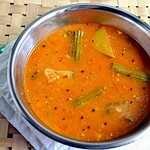 If you like to make Hotel style sambar sadam recipe, please check this link. For Karnataka style Bisi bele bath, check out this link . Wash rice & toor dal.Drain the water & Set aside. Wash & chop all the required vegetables. In a pressure cooker base, heat oil and splutter mustard seeds, methi seeds,curry leaves and coriander leaves. Saute for a second. Add sliced onion, slit green chilli and saute till onion turns transparent. Lastly add the chopped vegetables.Saute for a minute. Add the washed rice, dal and 5 cups of water. Mix well and check for taste.Add more salt, chilli powder or sambar powder if needed. Close the cooker and pressure cook for 2 whistles in very low flame.Open the cooker after steam is released. Mix well. ( If you want to add tamarind extract, add it now, boil for a minute till its raw smell goes off).Don't forget to garnish with chopped coriander leaves and add 1 tbsp of ghee. Serve hot with chips, papad or pickle if you like ! Red chilli powder and coriander powder are not given in the original recipe.So if you don’t have in hand, just add 2 tsp of sambar powder instead of 1 tsp. Tamarind is not used in this recipe. If needed, you should add tamarind extract only after opening the cooker at the end because rice & dal won’t cook mushy in tamarind extract. Adding coriander leaves and ghee is a must. It gives a nice flavor. The quantity of water depends on the texture you like. I like it mushy,so I added 6 cups of water. 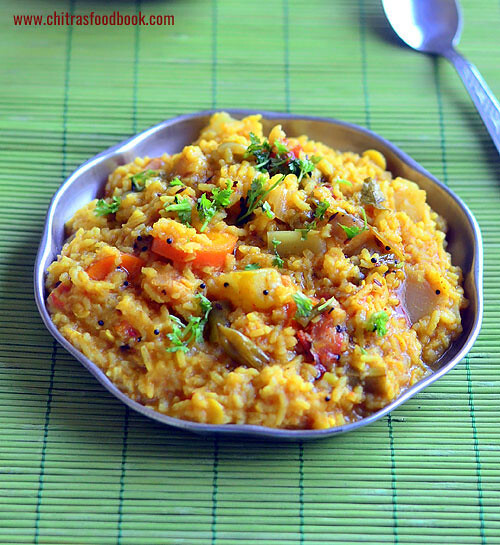 Try this easy, one pot sambar rice recipe and have a quick, hassle free lunch ! In my veg biryani series, I had already shared a Chettinad style baby potato biryani in pressure cooker. But this baby potato Dum biryani is a completely different version. I tried this recipe after watching this video. Usually aloo Dum biryani is prepared by shallow or deep frying sliced potatoes, marinated in curd+ spices mixture, made into a gravy and then layered with parboiled basmati rice. When I was browsing for various small potato biryani recipes, I was scared to see the tedious process because I had very less time in hand to prepare our Sunday lunch. But convincingly, I got this recipe.Feedback from readers made me try this recipe without any second thoughts. 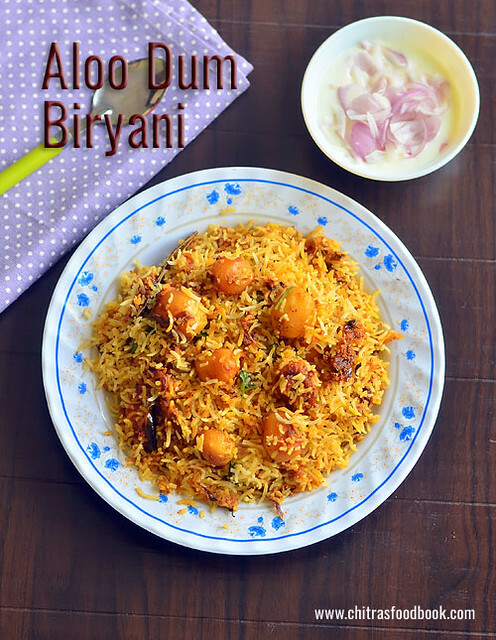 I loved the idea and simplicity of this recipe.Yes, This baby potato biryani is a much simplified version when compared with the traditional ones.This recipe involves no marination, no frying and taste wise there is no compromise at all. It tasted great just like Hyderabadi Veg Dum biryani. We all loved it & relished with onion raita. You can try this biryani for any special occasions like birthdays, wedding anniversary to treat your family. 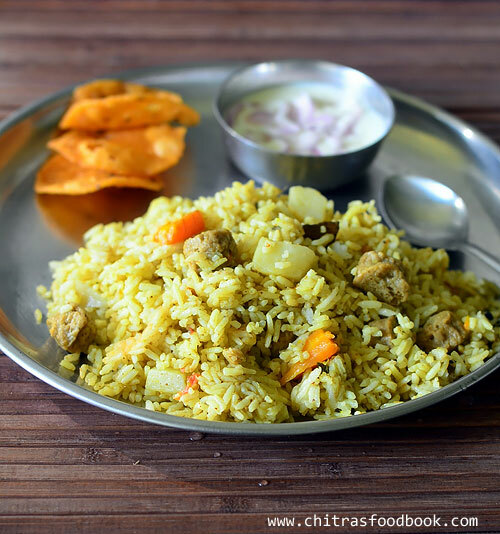 Kids would love this biryani for sure as it has their most favorite vegetable – Potato . You can try this biryani in a pressure cooker using regular potato as well. Lets see how to make aloo dum biryani recipe using baby potato with step by step pictures and video ! Ugadi festival is around the corner. 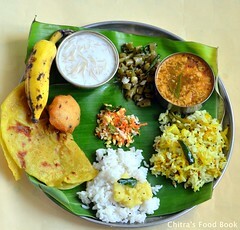 This year for Ugadi, I am sharing a Karnataka special delicacy Mavinakayi Chitranna recipe. 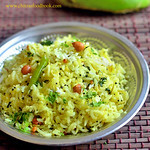 Its nothing but raw mango rice recipe ( Mangai sadam) prepared in Karnataka style. I learnt this recipe from my School moms friend Archana. When I was asking her about Ugadi special recipes of Karnataka other than holige/Obbattu, she told me that they make Mavinakayi chitranna , Mavinakayi chutney, kosambari, obbattu saaru and some palya for the festival. As I had already shared Holige recipe and easy obbattu saaru recipe,I wanted to try Kosambari and mango chitranna this year. Actually our friend Tara told me another recipe for Mavinakayi chitranna adding onion and roasted methi seeds powder. I will post that version later. I found many variations for this particular recipe on net. 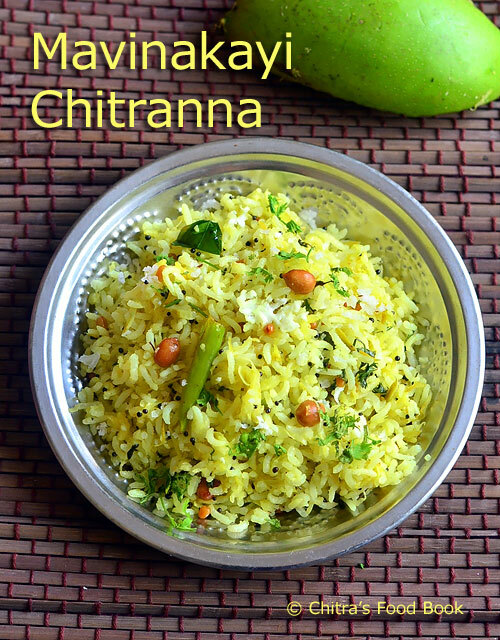 As I am sharing a festival recipe, I wanted to make a simple no onion, no garlic green mango rice and I followed my friend's recipe blindly :) So here you go, Ugadi special Karnataka style mango rice recipe – Mavinakayi chitranna with step by step photos and a video ! 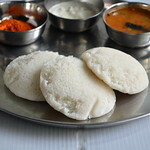 Check out my Holige recipe, easy obbattu saaru, Karnataka Ugadi lunch menu post ! Check out my Andhra Ugadi pachadi recipe, pulihora and boorelu recipes. Wash and pressure cook 1/2 cup of rice ( you can use raw rice or steamed rice) adding 1.25 cups of water and few drops of cooking oil. I used steamed rice/ Boiled rice. I used 1:3 ratio of rice and water. After the rice is cooked, spread it in a plate and add a tsp of oil around. Let it cool down. Measure 1.5 cups of cooked rice and keep aside. Wash and grated a medium sized raw mango. Taste it to check its sourness. After grating measure 3/4th cup of it and set aside. Pls refer the pic above. Adjust the quantity of raw mango based on its tanginess. Heat oil in a kadai.Splutter mustard seeds.Add urad dal, chana dal and peanuts. Roast till peanuts are done and dal turns golden brown in color. Roast it in medium flame. Now add the slit green chillies, curry leaves and half of the chopped coriander leaves. Saute for a minute. Now add the required salt and turmeric powder.Mix well. Some people add raw mango,saute for a minute and then add the rice. But I added the cooked rice first and tossed well for a minute then added the raw mango as the sourness of my mango was less. My friend also told me to do the same. You can saute the raw mango before adding the rice if its too sour. It can be done in either ways. Lastly add the grated mango and mix well for a minute. Check for taste. If the taste is too sour, add some more cooked rice, some red chilli powder or slit green chillies to balance the sour taste. You can add more rice or grated mango based on your taste. Mix well and cook for a minute.Switch off the flame and garnish with coriander leaves and grated coconut. Serve hot or warm as u wish. For variations, you can make the raw mango paste without coconut seperately, refrigerate it for a week and then mix with cooked rice whenever needed.For this, add the grated raw mango after the tempering is done. Allow it to cook for a minute and switch off the flame. Let it cool down and then store in a box. Use clean spoon to handle. Adjust the quantity of green chillies based on the sourness of mango. I have used steamed rice ( Puzhungal arisi). Generally raw rice is used. You can add basmati rice as well. The quantity of rice may vary based on the sourness of raw mango. My mango was not too sour. It is optional to peel the skin of mango. As we are grating the mango, it is not necessary to peel the skin. Some recipes call for grinding mango, coconut, green chillies and add to cooked rice. You can try this method for variation. Do not avoid coriander leaves. It lends a nice flavor to the rice. Add half of the coriander leave while tempering and the remaining to garnish. 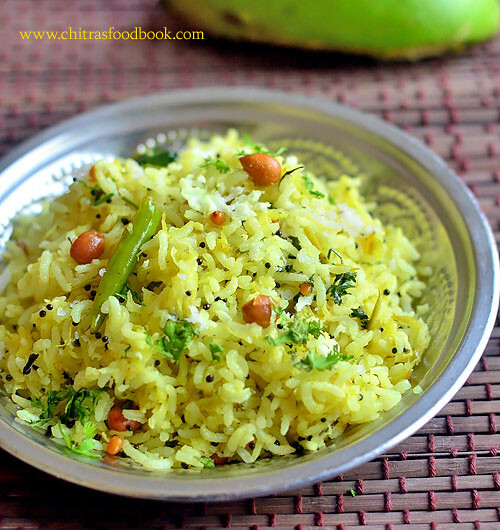 Try this simple and yummy raw mango rice at home, enjoy your lunch ! 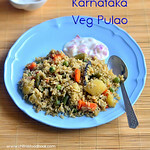 Here is a fool proof, Karnataka special Vegetable pulao recipe (vegetable palav) with step by step pictures and video. 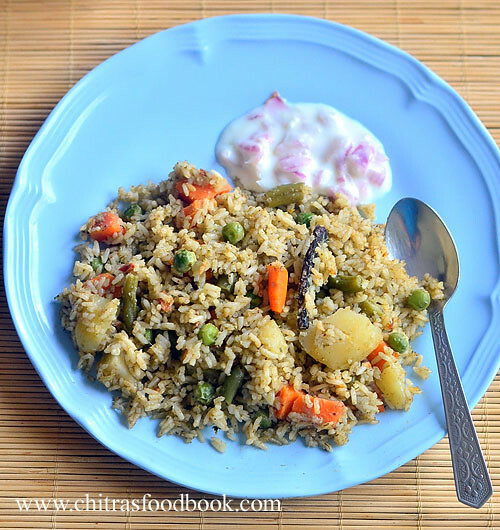 This mixed vegetable pulao is a must and should recipe in all the weddings, lunch buffet and parties in Bangalore, Karnataka. In hotels, its called as rice bath or veg palav in the menu. In our school moms group, we used to conduct kitty party once in a month in one of our houses. Mostly it would be a lunch party. I still remember Tara’s kitty party lunch menu. I had this pulao for the first time in her house and after that in few hotels, marriage functions and birthday parties. My friends call this as “Palav” in Kannada. 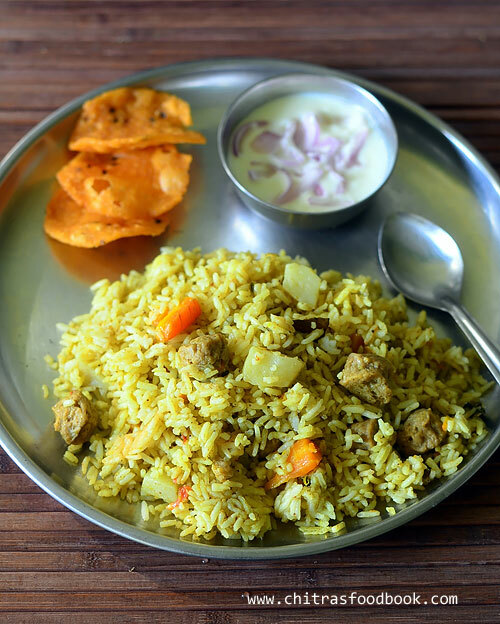 I am a big fan of this Karnataka style pulao especially for its wonderful flavor. I don’t mind eating one full plate of it. I got this recipe from Tara and made it for our Sunday Lunch last week. It came out very well with the awesome masala flavor which is the highlight of this pulao. Tara makes it super spicy and very tasty. The whole pot gets emptied in few minutes. Thanks a lot Tara for teaching me this wonderful, authentic Karnataka veg pulao recipe to me. Now I am confident enough to try this rice variety for my guest and parties. This pulao looks mild green in color. In some hotels here, they serve a red colored pulao adding red chilli powder. If you are looking for that version, check out this delicious and Restaurant style SPICY VEG PULAO recipe which I learnt from my another friend Megha. 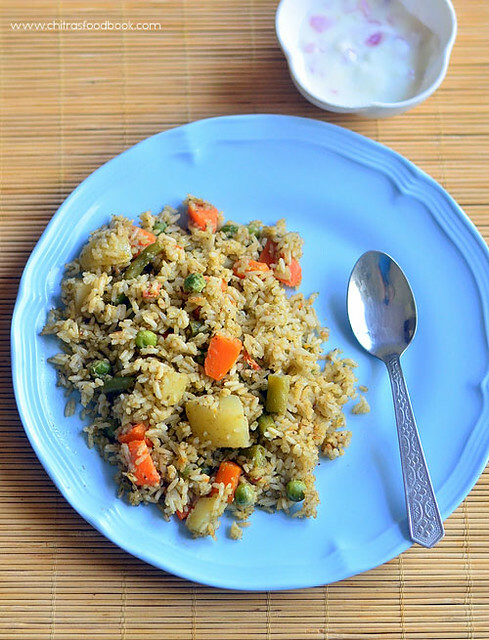 Now lets see how to make this yummy, Karnataka style Vegetable pulao with step by step pictures and video ! Wash and soak 1 cup of rice in 2 cups of water for 15 to 30 minutes. Wash and chop the vegetables into small cubes. Grind the ingredients given under “ To grind” to a smooth paste by adding required water. Set aside. Heat oil in a pressure cooker base and add the whole garam masala. Saute until aromatic and then add sliced onions. Saute till transparent. Now add the tomato pieces and saute till mushy. Add the ground masala paste. Mix well for a minute. Now add chopped vegetables, mix well for a minute. Then add the soaked rice along with water. Add dhania powder, crushed kasoori methi(optional) and required salt in the water. Mix well. Take some water and check for taste. Add more salt if required and slit green chilli for spicy taste. Pressure cook in very low flame for two whistles. Open the lid after the steam is released completely. Fluff the rice gently with a fork. Remove in a plate and serve hot with onion raita ! This rice looks slightly mushy when hot. But rice grains become fluffy and separate as it cools down. If you are making it for parties or functions, make this pulao one hour in advance and let it be in the cooker to stay warm. If it cools down, sprinkle very little water and reheat it for few minutes before serving. Tastes and smells yum ! My friend Tara adds 8 to 10 chillies for the mentioned quantity. But I used 6 as my chillies were spicy. Adjust the quantity based on your taste. You can even add slit chillies in the water if you feel spiciness is less. If you want, you can use red chilli powder or red chillies instead of green chillies while grinding the masala. Good quality raw rice is used for Karnataka style pulao. You can replace with basmati rice of you wish.In that case, use 1:1.5 cups of rice and water ratio. 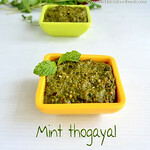 For variations, you can use coriander leaves instead of mint leaves but flavor may vary. 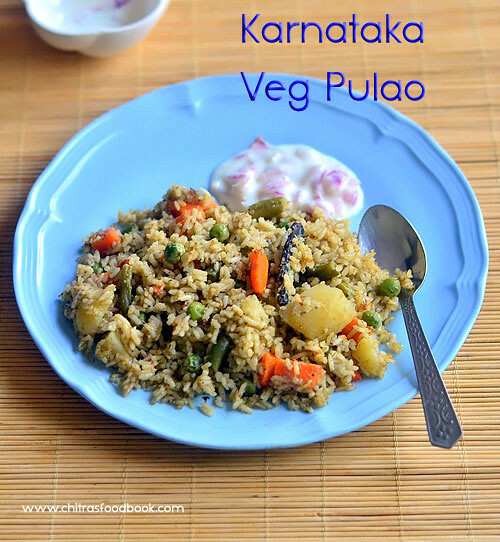 Try this yummy, spicy Karnataka style veg pulao for your weekend lunch or lunch box,Enjoy !